Scotland's pro-union political parties have announced details of the commission to re-examine devolution, a decade after it came about. The body will be chaired by academic Sir Kenneth Calman - who insisted it would be independent and would not dictated to by outside forces. 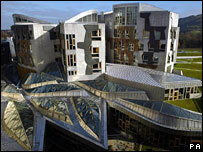 The constitutional commission, to be funded by the Scottish Parliament and UK government, was voted for by MSPs. The Scottish Government already has its own constitutional review under way. The remit of the new commission was outlined in the Scottish Parliament, at an event attended by Sir Kenneth and the Labour, Conservative and Liberal Democrat Holyrood leaders - Wendy Alexander, Annabel Goldie and Nicol Stephen. The commission - which will not examine independence - has been tasked to review devolution and recommend changes to enable the Scottish Parliament to better serve the people and "continue to secure the position of Scotland in the United Kingdom". Sir Kenneth, who described himself as a Scot happily living in the UK, said Scottish devolution had now reached one of its most interesting points. "It is a genuine opportunity to take stock of what the settlement has achieved to date and the challenges it may yet have to address in the years to come," said the chancellor of Glasgow University. Welcoming the commission, Prime Minister Gordon Brown said: "Together we are determined to review the provisions of the Scotland Act in the light of ten years' experience, while securing Scotland's place in the Union." The Scottish Parliament's vote for the constitutional commission came after the Holyrood government launched its "national conversation", which is examining the case for independence.